Nike has reported almost a dozen executive-level departures in the past two months. Surveys taken by a group of women at the company's Beaverton, Ore., world headquarters reportedly landed on Parker's desk and led the company to move swiftly. In a New York Times exposé, transgressions included company emails that mentioned women's body parts and a male supervisor cornering a woman in the bathroom. In April, five more senior leaders departed and more were reported last week. This has left some former Nike employees shocked at the reckoning and hopeful — if wary — that the company that made Portland "Sneakertown" can change. Among the surprised is Ann Wallace. After 14 years working for the Nike information technology department, she left her role as a principal cloud security architect in January. "That was a really tough decision. I didn't want to leave Nike necessarily," she says. "My whole time at Nike — I mean, the majority of it — I loved the company. I loved working there." She recalls the family dynamic she felt while working as a contractor at the Beaverton headquarters that made her determined to become a full-time employee. As an avid runner, she related to Nike's athletic mission. "We're part of the Nike culture ... you would see different sports people walking around," she says. "My first week at Nike, there was Michael Jordan and Tiger Woods. You just felt part of Nike." But then about six years ago, things changed within her department — what she describes as "a whole shift." "A new CTO (chief technology officer) came in, and he brought a lot of his friends in," Wallace says. "And a lot of women who were in upper management positions within the IT organization kind of went elsewhere, either other roles in Nike or outside of Nike." The departing women included Wallace's boss, who Wallace says had protected her staff from misogynistic behaviors within the IT organization. "Certain individuals within that organization would constantly berate women, talk down to women, interrupt." And there was the trip to Las Vegas for a tech conference where she and another female colleague would be presenting. They were the only two women from the IT department to attend. The conference organized a pub crawl, and Nike rented out a restaurant on the way. Wallace and the other woman in attendance were told to chat with people when they came in. If they seemed like good job candidates, Wallace was to ask for their room number so they could be sent gift bags with a Nike Fuel Band, the brand's fitness tracker. "I don't feel like anyone thought through the fact that they were asking women at a tech conference, which is primarily males, who have been drinking in Vegas, for their room number," Wallace says. She and her colleague nodded and agreed but did not follow through with the request. "I didn't feel comfortable asking a random guy for his room number," Wallace says. She also didn't feel comfortable about the women who had been hired to entertain them. "They weren't stripping but they did not have much clothes on, and toward the end of the event, a lot of our male colleagues were drinking and dancing with them. And my co-worker and I just watched what was going on and eventually left," she says. "It was just a really uncomfortable position to be in as far as a work-sponsored event." Wallace did not report these events to anyone because she says there was no one to report to. Her superior had hired the entertainment. But she says there were other times when she reported misconduct and was told that she was being too sensitive or that it was hard to fire people. "Which, at that point, gave me the feeling like nothing is going to be done," Wallace says. "I didn't feel comfortable going to employee relations about this because I'd heard of a lot of people going to them and when they would speak up, it would leak out, and I didn't want any retaliation." Despite her experiences and complaints, when the media started reporting firings at Nike, Wallace was taken aback. "Things that have happened over my career at Nike I just thought was more IT, not so much Nike," Wallace says. "We know being a woman in tech is difficult so when I was reading the things that came out about Nike, I was surprised. But at the same time, (with) all the other things that have come out in the last year about the 'me too' movement, I'm not surprised either." The pros and cons of a "jock mentality"
We recognize and acknowledge that there have been behaviors inconsistent with our values that prevented some employees from feeling respected and doing their best work at Nike. We are determined to take the insights that we've gained to build a culture that is truly inclusive and representative of diverse thoughts, backgrounds and experiences. We're already taking action and will continue to drive change to elevate a culture of inclusion and respect. D'Wayne Edwards was a designer for the Jordan Brand of Nike products and has since founded the footwear design academy Pensole in Portland. He says the laser focus on the athlete at Nike has made the company what it is today — from the successes to the current shake-ups. "There are certain pockets of the company where that jock kind of mentality kind of does exist," he says. "And I guess it spills over into some of the corporate processes." He tells his students they should have a full understanding of who they are and what their employer is about before they start their careers. At Nike, he says the culture around athletics and the tendency to hire athletes meant a lot of people didn't understand "that this is not the locker room. This is a corporate environment, and there's a different way to act and behave." 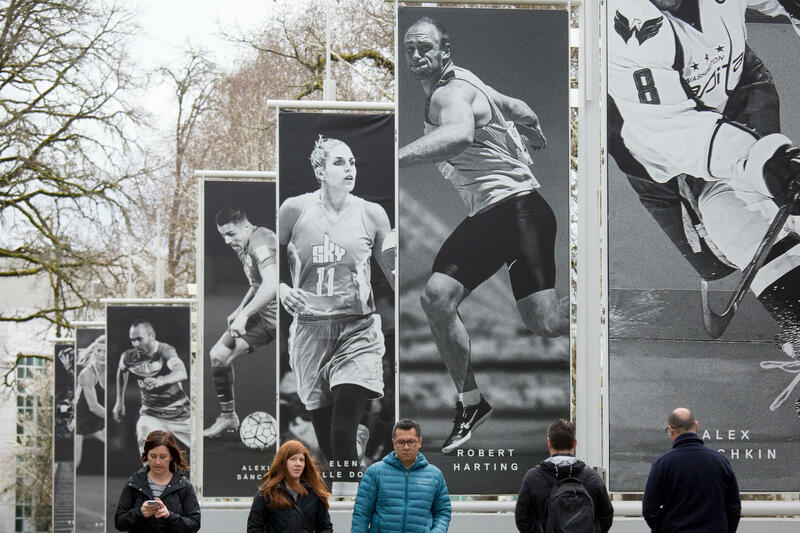 About half of the departing executives at Nike were people of color. The Wall Street Journal reported that in a memo to staff, HR executive Monique Matheson wrote, "We need to improve representation of women and people of color." But Edwards is skeptical, asking, "What are you doing to make that happen?" He doesn't see evidence that Nike has a plan. News of the dismissals have not hurt Nike investors, but some analysts see a link between the company's domestic retail performance and problems at headquarters. Liz Dunn, founder and CEO of Pro4ma, says, "They've struggled with their efforts to market to women." Dunn notes that competitors Adidas and Under Armour, which also have headquarters in Portland, are doing better with women and are gaining on Nike in market share overall. Nike is depending on the women's market to reach its goal of becoming a $50 billion company by 2020. Parker has said 60 percent growth in the women's market would make it possible. But Dunn says, "They've had a lot of talent leave the organization. Not just these people who have been dismissed but also the women who have been leaving because their careers have been stalled." Wallace says at least five other women left Nike at the same time she did. But some women have been promoted to some of the vacated positions, and Wallace finds solace in that. "I still have a lot of women friends who work there, so I hope for their sake and whoever comes next it does change," Wallace says. "I think it will." Nike is going through an executive shakeup over sexism and harassment in the workplace, and now the shoe and athletic gear company is trying to rebuild. From Oregon Public Broadcasting in Portland, Erica Morrison has the story. ERICA MORRISON, BYLINE: After 14 years working in Nike's IT department, Ann Wallace left the company in January. ANN WALLACE: That was a really tough decision. I didn't want to leave Nike, necessarily. My whole time at Nike, I mean the majority of it, I loved the company. I loved working there. MORRISON: But things changed in her department when her boss, who was also a woman, left six years ago. Wallace says her team was no longer protected from misogynistic behaviors. WALLACE: Certain individuals within that organization that constantly would berate women, talk down to women, interrupt. MORRISON: Shoot down their ideas, make excuses for disrespectful behavior of male counterparts. And there were the scantily clad women hired as entertainment during out-of-town recruitment events. After many complaints to management and being told she was too sensitive or that it was too hard to fire people, she left. Then in March, something happened Wallace didn't expect. Nike President Trevor Edwards announced he would be retiring from the company in August. The next day, it was announced Vice President Jayme Martin was leaving. In April, five more senior leaders' departures were announced. Then The New York Times reported more last week, bringing the total to 11. Nike is in the midst of a company-wide overhaul. An informal survey of women at the Oregon headquarters revealed complaints of pay inequity, inappropriate workplace behavior and a lack of career advancement for women. The survey was delivered to CEO Mark Parker. He's apologized to people who were excluded and called them brave for speaking out. WALLACE: When I was reading the things that came out about Nike, I was surprised, but at the same time with all the other things that have come out in the last year with the Me Too movement, I'm not surprised, either. MORRISON: Wallace says she wasn't aware that problems were so widespread. WALLACE: I think it's been labeled in articles as workplace bullying. D'WAYNE EDWARDS: Certain pockets of the company where that athlete, that jock kind of mentality kind of does exist, and I guess it spills over into some of the corporate processes at times. MORRISON: D'Wayne Edwards was a designer for the Jordan brand of Nike products. He says the laser focus on the athlete at Nike has made the company what it is today, from the successes to the shakeups happening now. EDWARDS: Maybe in this instance, it may have, you know, hurt them a little bit by having a bit too much of testosterone. EDWARDS: That this is not the locker room. This is a corporate environment, and there's a different way to act and behave. LIZ DUNN: Perhaps if this wasn't the environment there, their women's business might be bigger. MORRISON: Retail analyst Liz Dunn says there's a connection between Nike's in-house problems and the company's retail performance in North America. The company's sales have slowed in the U.S. Adidas and Under Armour are gaining on them. DUNN: They've struggled with their efforts to market to women, and they've had a lot of talent leave the organization, not just these people who have been dismissed, but also the women who've been leaving because their careers have been stalled. MORRISON: Ann Wallace can name five other women who left when she did. She works at Google now. She says she has faith Nike will improve. WALLACE: I still have a lot of woman friends who work there so I do hope for their sake and whoever comes next it does change, but, I think it will. MORRISON: A Nike spokesperson says the company is determined to build an inclusive workplace culture and has taken the steps to do so. For NPR News, I'm Erica Morrison in Portland. Transcript provided by NPR, Copyright NPR.